It can be used for making payments at participating Pizza Hut Restaurants & Delivery Outlets in India. To use this Instant Gift Voucher for home delivery, please quote your 16 digit voucher number at time of placing the order. This Instant Gift Voucher is for one time use & any unused balance cannot be used again or be exchanged for cash. No cash refund will be given against the voucher (including case of loss or otherwise). 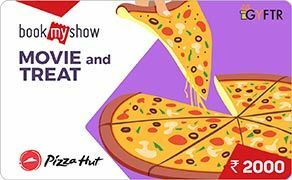 Yum Restaurants or affiliates are not responsible on account of the beneficiary sharing the Instant Gift Voucher number and the Voucher getting redeemed on that account. The user unconditionally accepts all T&C and shall not raise any disputes in this regard. All disputes subject to exclusive jurisdiction of courts at New Delhi.